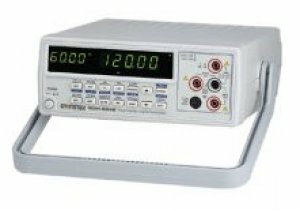 The GDM-8246 bench-top DMM is equipped with a rich set of features. It offers a 50,000 count meter with large dual 7 segment LED displays. The display is capable of showing two electrical characteristics at once: ACV plus frequency or dBm, DCV plus dBm or ACV ripple. The GDM-8246 carries an extensive list of measurement items - DC Voltage/Current, AC Voltage/Current with true RMS, Resistance, Capacitance, Frequency, Continuity (with beeper), Diode Test, and dBm. Additional measurement functions, such as Max/Min hold, Relative value, and Compare ease setup and diagnosis burdens. The GDM-8246 supports remote control and data-logging using standard IEEE488.2 protocol or proprietary Windows based software via an RS-232C or optional GPIB interface.